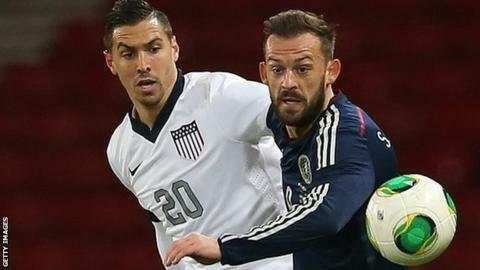 Sunderland striker Steven Fletcher and Celtic midfielder Charlie Mulgrew will not feature for Scotland in Tuesday's friendly against Norway in Molde. And Blackburn Rovers defender Grant Hanley is struggling with an injury. Mulgrew picked up a slight injury and was given permission to return to Celtic in light of his club's Champions League schedule. Fletcher has just returned to action with Sunderland following injury and was also excused from further action. It means that Everton's Steven Naismith will be favourite to start up front for the Scots in Molde after leading the line prior to Fletcher's return to the squad and with late call-up Ross McCormack the only other striker left in the squad. Manager Gordon Strachan had indicated that players like Charlie Adam, Ikechi Anya, Craig Bryson, Russell Martin and James McArthur, who were unused substitutes on Friday, will start against the Norwegians. Fletcher, Hanley and Mulgrew all played in the 0-0 draw with USA in Friday's friendly at Hampden Park. Mulgrew had earlier dismissed suggestions that he might struggle to make Tuesday's friendly after suffering a late knock when he took a knee to the thigh. "It's all right," he said. "He caught me on the nerve and it went numb, but it's fine." Mulgrew was back in central midfield alongside captain and Celtic team-mate Scott Brown against USA after playing at left-back in last month's 2-0 win over Croatia when Steven Whittaker was suspended and Lee Wallace injured. "I am enjoying it in there, I get a lot of the ball," said the 27-year-old. "I enjoy playing with Broony. I hope he enjoys playing with me. We work hard together and it's good to get a lot of the ball." Both sides spurned what few chances were created at Hampden on Friday, but Mulgrew thought the performance against a team ranked 13th in the world and who have qualified for their seventh successive World Cup finals was proof of continued progress under Strachan. "It wasn't too bad," Mulgrew said of the performance. "They had a lot of the ball, but we battled well and it was a good clean sheet and not a bad performance. "We are working on a lot of things and the manager is bringing a lot of ideas. "We are getting there slowly but surely with a couple of very good results along the way. "We have a lot of forward-thinking players, but they also have a defensive mentality as well and they do their work for the team, which helps everybody. "We defend as a team and attack as a team, which helps everybody and we just need to keep that going." Mulgrew said Strachan had pinpointed "a few things" they would work to improve on ahead of the match in Molde. Forwards: Steven Naismith (Everton), Ross McCormack (Leeds United).